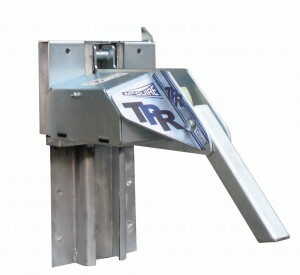 “TPR®” AUTOMATIC VEHICLE RESTRAINT | Dock Door Systems Inc. The TPR® truck positioned vehicle restraint is designed to automatically position itself and secure a trailer’s rear impact guard (RIG) to reduce the likelihood of premature trailer separation during the loading/ unloading process. The TPR is designed to withstand a pulling force in excess of 35,000 lbs, and has a service range of 4” to 10” horizontally from the face of the dock bumpers and 9” to 27” vertically above drive approach. The integral motor, gear and brake assembly is specifically designed for the TPR. The TPR vehicle restraint is highly adaptable to new or existing loading docks. Restraining Force In Excess of 30,000 lbs.